The ARTS GROUP OF UNION AVENUE hosts its 23rd ANNUAL UACC CHILI COOK-OFF this Sunday, January 27, immediately following worship. All the action takes place in the DINING ROOMon the lower level. 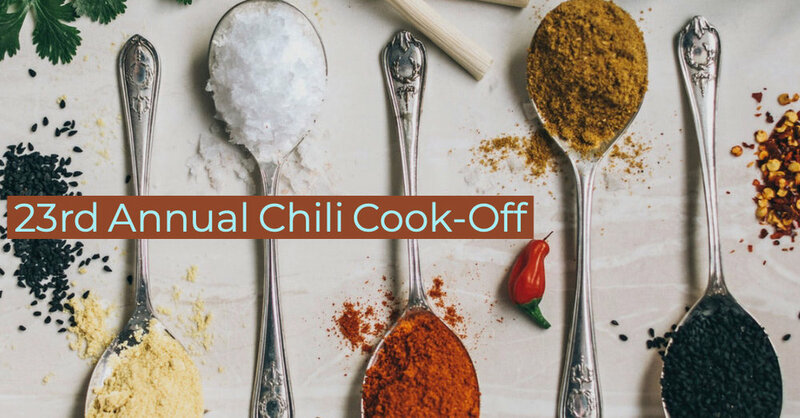 Members and friends are invited to enter a favorite chili or soup in the competition to crown the new "royalty" and compete for the coveted traveling Red Chili Trophy. It's always a terrific opportunity to sample some tasty chili (and soup) recipes while enjoying the company of friends. Please plan to join us, and dust off your best chili or soup recipe to enter the friendly competition! Additional information: For the person bringing chili/soup, the event is free; if not, tasters pay $5 per person for those 10 and older and children under 10 are $3. When you arrive on the 27th there will be a cart at the parking lot entrance on which you may place your chili or soup entry. Please be sure to give your chili or soup a name on the slips of paper you will find on the cart, attaching that information to your container. Members of the Arts Group will take it from there — including heating up, laying out garnishes, etc. There will also be hot dogs and macaroni available for those who wish to make chili dogs or chili macs. The fixings for make-your-own brownie sundaes will be ready for dessert. THE CHILDREN OF UNION AVENUE CHRISTIAN CHURCH have thrown down the gauntlet of challenge and are CHALLENGING MEMBERS AND FRIENDS to bring canned chili and hearty soups to this year's CHILI COOK-OFF for our friends at the MEMORIAL BOULEVARD CHRISTIAN CHURCH FOOD PANTRY. When the dust settles and new royalty has been crowned, the children believe their mountain of cans will exceed that of the rest of the congregation. Consider yourselves challenged!